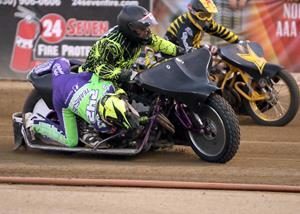 On the eve of the second round of the AMA USA National Championship in Ventura, Billy Janniro was tuning up Friday night at Fast Fridays Motorcycle Speedway in Auburn with a flawless evening in the scratch program. Janniro won all his scratch program races included the main event, making him the fastest man of the night for the fifth time this season. 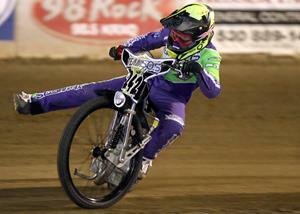 Janniro has now won five of seven scratch main events this season. 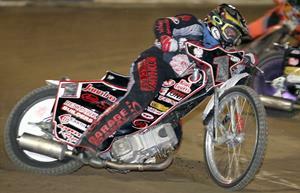 The only rider to beat Janniro in the scratch main event this season has been Auburn’s Bart Bast. This week it was Auburn’s Tommy Hedden who gave chase. Hedden and Janniro went at it for a lap or two on the inside with Ryan Bast out of lane three hanging just behind them on the outside. Bart Bast who drew lane four trailed his cousin Ryan Bast. With a track this week a little thicker Janniro was difficult to contain and though he stayed low on the track coming out of lane one Janniro had little trouble handling Heddden increasing his lead with each lap, checking over his shoulder. Janniro finished first, Hedden took second, Ryan Bast was third and Bart Bast was fourth. Young Blake Borello is keeping his game in order with another win in the handicap main event. Friday night the 17 year old Georgetown resident picked up his third handicap main event of the season earning 10 extra yards added to his start position next week. Borello will now take his place on the 20 yard line. Billy Janniro was third and Russell Green was fourth. Borello was also first in his handicap semi final heat. Sammy Tetrault continued to dazzle with another impressive win in Division II. Tetrault has made a fast move up since graduating from the youth division this year. The win gives the 16 year old two wins each in division II and division III so far this season. Tetrault won his heat race along with the main event. “I got off a good start and looked back once realizing they couldn’t catch me, then I rode my race, it was fun,” said Tetrault. Matt King was second and Fred Cook was third. Peter Pecorilla picked up his second main event win of the season in Division III. Pecroilla was also perfect winning his heat along with the main event. Casey Cornilsen was second and Ray Holt Jr. was third. “It was great, I’ve won two this year, I come down from Nevada each week, I didn’t have a win last year so this is huge,” said Pecorilla. Cameron Krezman continued his roll winning his fourth Youth 250cc main event. 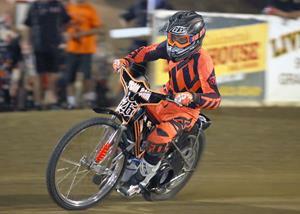 Krezman has won or finished second in all Youth 250cc main events this season. Krezman again battled Landon Norton who was second and who also has finished first or second in the Youth 250cc main events this season. 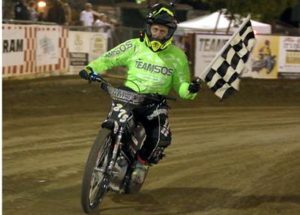 Up from Southern California for the second week Travis Horn took the Youth 150cc main event and giving Charlie Trana a good run for the checkered flag. 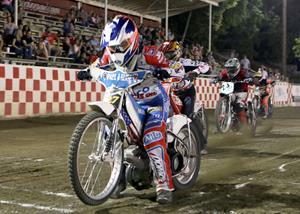 Trana, who has won four Youth 150cc main events this season, had to yield to the young man from down south. Trana was second and Mason Zebroff was third. 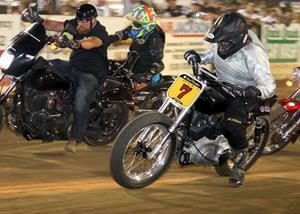 In a special vintage night event Fast Fridays looked back recognizing riders and the vintage bikes they rode over twenty years ago. Four riders turned out with upright 500cc motors to relive the old days. Tommy Hedden won the vintage main event. Kurtis Hamill was second and Fred Cook was third. 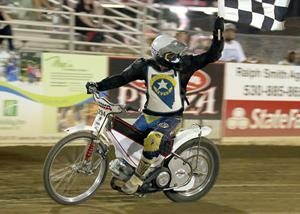 Longtime Fast Fridays announcer and former pro speedway rider Mike Rooney was riding his vintage bike with a 80 year old upright JAP motor on a 1972 frame. Most riders included a vintage face mask in their riding apparel for the special event. Next week make sure not to miss the speedway endurance event of the year. Fast Fridays presents their special 25 lap main event Friday along with their exciting weekly program. 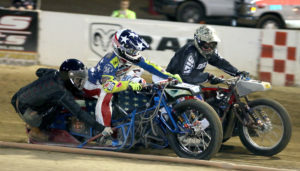 1-Peter Pecorilla, 2-Casey Cornilsen, 3-Ray Holt Jr.
Blake Borello (front) leads a restart in the handicap main event. Borello went on to win the handicap main event. Billy Janniro won his fifth scratch main event Friday night. Peter Pecroilla won his second division III main event Friday night. Sammy Tetrault leans into turn three on his way to another division II main event win. 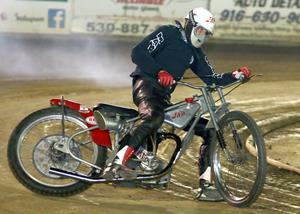 Auburn’s Tommy Hedden won the special vintage speedway main event. 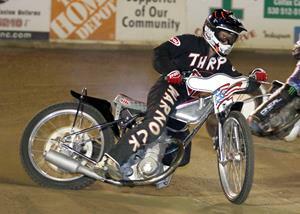 The annual event recognizes speedway bikes and riders from the past. 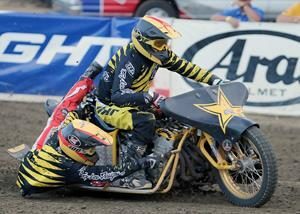 Longtime Fast Friday’s announcer Mike Rooney participated in vintage night riding a bike he raced on in his professional career.